This portrait of Yarrow Mamout in the Peabody Room of the DC Public Library Georgetown Library in Washington, DC was done by 17 year old Georgetown artist James Alex Simpson in 1822. 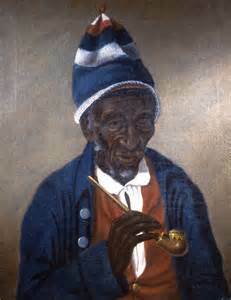 Another original painting of Mamout by Charles Wilson Peale (1741—1827) hangs in the Philadelphia Museum of Art. Yarrow Mamout was born in 1736 in Guinea. At 16 years, he was enslaved and brought to Maryland. After over 40 years of enslavement, he was freed. Yarrow married and had a child. It is still uncertain whether the child was a son or daughter.Scholars believe his family name is Yaro and that he was a Fulani Muslim. Observers of the time noted that Yarrow Mamout performed the 5 daily prayers, sang praises to God, abstained from pork and alcohol, professed to be a Muslim and read and wrote in Arabic. 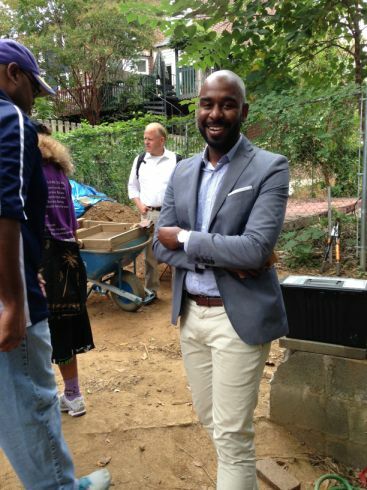 He was highly regarded in the Georgetown community for his financial acumen and business enterprises. He owned his own home and in 1803 he transferred the property deed to his 15 year old child. In the summer of 2015, the D.C. Historical Preservation Office launched an archaeological project at the site of Yarrow Mamout’s Georgetown home in response to public interest and concern about the historical integrity of the property (3324 Dent Place, N.W.). The project is the dissertation topic of University of Florida doctoral student, Mia Carey. Howard University doctoral student Muhammad Fraser-Rahim, frequently lectures on Yarrow Mamout. On September 26, 2015, the Center for Contemporary Arab Studies at Georgetown University in partnership with the Center for African Studies and School of Education at Howard University, and George Mason University’s Ali Vural Ak Center for Global Islamic Studies hosted a seminar for classroom teachers and the public at Georgetown’s Intercultural Center. A trip to the site was a part of the seminar. Assistant city archaeologist Chardè Reid and city archaeologist Ruth Trocolli were on hand to provide information and answer questions. Author James Johnston gave a lecture on Mamout’s life and significance. He is the author of From Slave Ship to Harvard: Yarrow Mamout and the History of a African American Family. Johnson, James. From Slave Ship to Harvard: Yarrow Mamout and the History of a African American Family. 2012. Yarrow Mamout, Facebook page, Yarrow Mamout Archaeology.